120 repeat guests have enjoyed this lovely three bedroom, three bath home located just 100 steps from the beach. The charming, gated community of Sunrise Beach is a popular location along scenic Highway 30A in Santa Rosa Beach. Enjoy gulf views, sounds of the surf, and fabulous sunsets from the two large wrap around balconies, or swim in the private heated pool. Beautifully furnished with a comfortable open floor plan, this home is located on the beach side of Highway 30A, across from Gulf Place, and close to Seaside, Grayton Beach, Baytowne Wharf, and the famous Silver Sands Outlet Mall. 'Sandy Feet' has an upside-down floor plan with the Great Room, Kitchen, and Master king bedroom upstairs to take advantage of the gulf views and breeze. Downstairs is a queen bedroom with private deck and the kid's bedroom with two sets of XL bunk beds. Also downstairs is the washer and dryer. A large downstairs deck offers additional seating and a place for your entire group to gather. We love the Gulf and white water of the Emerald Coast! Our families lived in Panama City, but when we looked for a beach house in 2001 we wanted the little neighborhoods and family atmosphere of 30A. 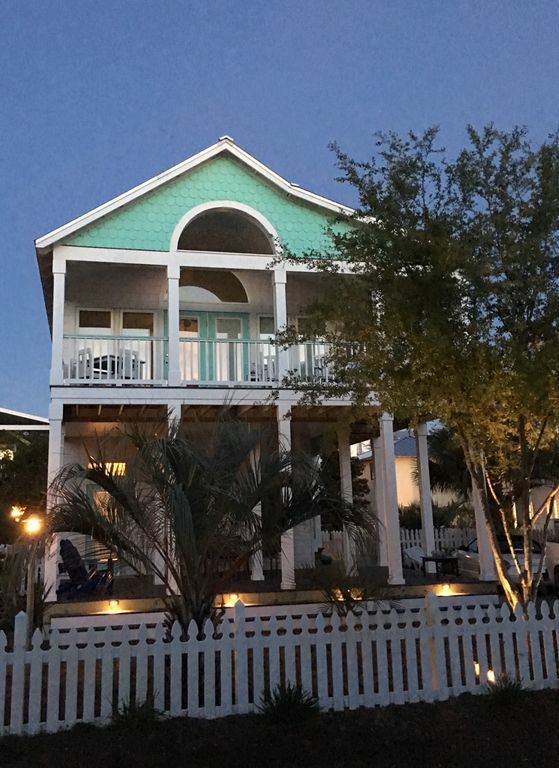 The appeal of 30A can not be found elsewhere in Northwest Florida: free concerts, fantastic food, multiple bike paths, wine tastings, interesting architecture, and no huge condos! Each bedroom has a full bathroom. Bathroom for King bedroom has been completely renovated in 2015: new walk-in shower with new vanity and toilet. Dining table seats eight. Additional dining table on upper deck seats four. New 65" TV in great room. All bedrooms have a TV. DVD player in great room and Kid's bedroom. New 2018 enlarged deck on lower level with teak table and four chairs plus additional seating. Private deck off Queen bedroom downstairs. Very near neighborhood Beach access. Private heated pool. Wireless Internet, Bozewave stereo with 5 CD changer and iPod connection, TV and DVD in living room and bedrooms. Beach chairs and umbrellas available for quest use. Restaurants, coffee house, retail shops, artists market, and weekly outdoor concerts in season at Gulf Place; 18 mile path along 30A for biking, hiking, jogging and roller-blading. Lifeguarded beach available from mid-March through September at Ed Walline public beach access next to Sunrise Beach neighborhood.